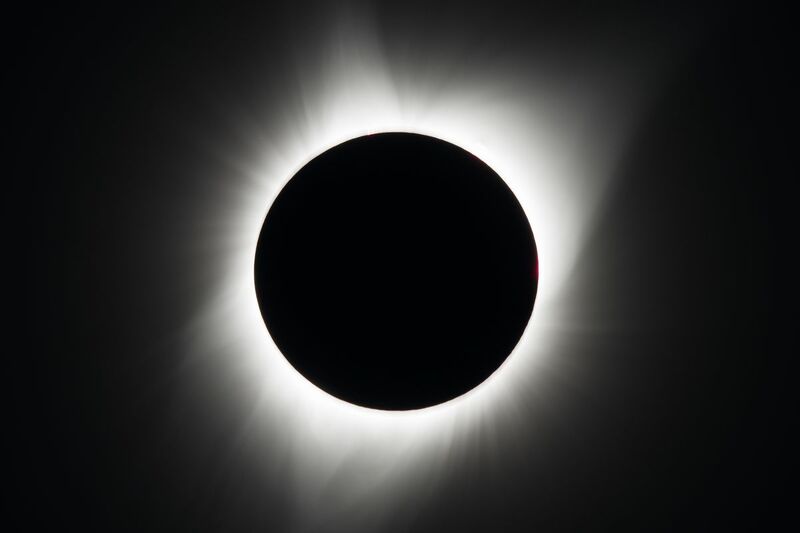 The last solar eclipse was in 2017. The totality in the picture lasted a little more than 2 minutes, while the process lasted about 2.5 hours. One of the great disputes in climate research is between those (IPCC) who dismiss solar cycles as a factor in climate change and those who see correlations in the past and keep seeking to understand the mechanisms. To be clear, there is considerable agreement that earth’s atmosphere can and does reduce or increase the amount of incoming solar energy (albedo effect), thereby contributing to surface warming or cooling. The science and research into the “global dimming and brightening” is discussed in the post Nature’s Sunscreen. A different investigation has been advanced by Dr.Indrani Roy, her most recent publication this month being a book Climate Variability and Sunspot Activity Analysis of the Solar Influence on Climate (H/T NoTricksZone). The book is behind a paywall, but the abstract and chapter headings indicate a comprehensive approach. This book promotes a better understanding of the role of the sun on natural climate variability. It is a comprehensive reference book that appeals to an academic audience at the graduate, post-graduate and PhD level and can be used for lectures in climatology, environmental studies and geography. This work is the collection of lecture notes as well as synthesized analyses of published papers on the described subjects. It comprises 18 chapters and is divided into three parts: Part I discusses general circulation, climate variability, stratosphere-troposphere coupling and various teleconnections. Part II mainly explores the area of different solar influences on climate. It also discusses various oceanic features and describes ocean-atmosphere coupling. But, without prior knowledge of other important influences on the earth’s climate, the understanding of the actual role of the sun remains incomplete. Hence, Part III covers burning issues such as greenhouse gas warming, volcanic influences, ozone depletion in the stratosphere, Arctic and Antarctic sea ice, etc. At the end of the book, there are few questions and exercises for students. This book is based on the lecture series that was delivered at the University of Oulu, Finland as part of M.Sc./ PhD module. To better appreciate Roy’s viewpoint, two of her previous publications provide the evidence and analytical thought behind her conclusions. Published in 2010 with J.D. Haigh was Solar cycle signals in sea level pressure and sea surface temperature Excerpts in italics with my bolds. We identify solar cycle signals in the North Pacific in 155 years of sea level pressure and sea surface temperature data. In SLP we find in the North Pacific a weakening of the Aleutian Low and a northward shift of the Hawaiian High in response to higher solar activity, confirming the results of previous authors using different techniques. We also find a broad reduction in pressure across the equatorial region but not the negative anomaly in the sub-tropics detected by vL07. In SST we identify the warmer and cooler regions in the North Pacific found by vL07 but instead of the strong Cold Event-like signal in tropical SSTs we detect a weak WE-like pattern in the 155 year dataset. We find that the peak SSN years of the solar cycles have often coincided with the negative phase of ENSO so that analyses, such as that of vL07, based on composites of peak SSN years find a La Nina response. As the date of peak annual SSN generally falls a year or more in advance of the broader maximum of the 11-year solar cycle it follows that the peak of the DSO is likely to be associated with an El Nino-like pattern, as seen by White et al. (1997). An El Nino pattern is clearly portrayed in our regression analysis using only data from second half of the last century, but inclusion of ENSO as an independent regression index results in a significant diminution of the solar signal in tropical SST, showing further how an ENSO signal might be interpreted as due to the Sun. Any mechanisms proposed to explain a solar influence should be consistent with the full length of the dataset, unless there are reasons to think otherwise, and analyses which incorporate data from all years, rather than selecting only those of peak SSN, represent more coherently the difference between periods of high and low solar activity on these timescales. The SLP signal in mid-latitudes varies in phase with solar activity, and does not show the same modulation by ENSO phase as tropical SST, suggesting that the solar influence here is not driven by coupled-atmosphere-ocean effects but possibly by the impact of changes in the stratosphere resulting in expansion of the Hadley cell and poleward shift of the subtropical jets (Haigh et al., 2005). 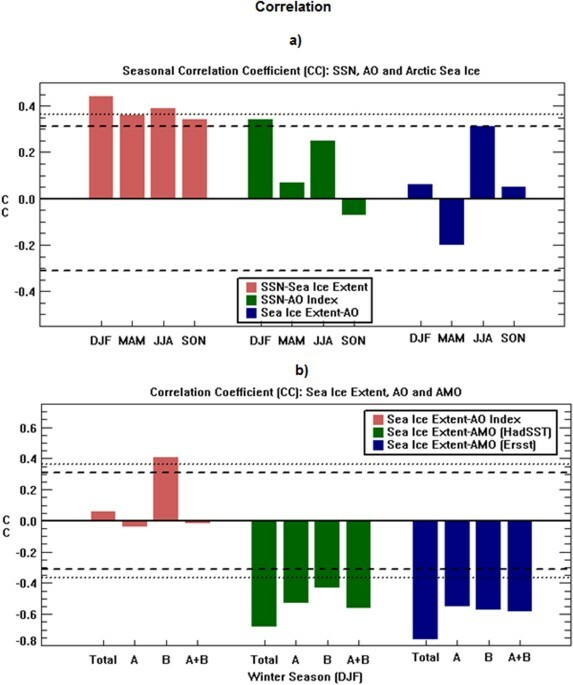 Given that climate model results in terms of tropical Pacific SST can be dependent on different ENSO variability within the models, our analysis indicates that the robustness of any proposed mechanism of the response to variations in solar irradiance needs to be analyzed in the context of ENSO variability where timing plays a crucial role. It is challenging to grasp this approach and results because she respects the complexity of solar and climate dynamics. For starters, she is not mining climate data in search of 11 year periodicities as others have done. Dr. Roy takes the dates of observed SSN maxima and minima and compares with repeated effects in climate measurements. Many readers will know that solar cycles are only quasi-11 years long; there is considerable irregularity. Even more importantly, SSN do not peak midway in the cycle, but can appear early on and show additional peak(s) afterward. She defines minima and maxima in terms of SSN significantly lower or higher than the mean. So Roy’s analysis is not simplistic, but correlates all years in the datasets comparing SSN with climate measures. 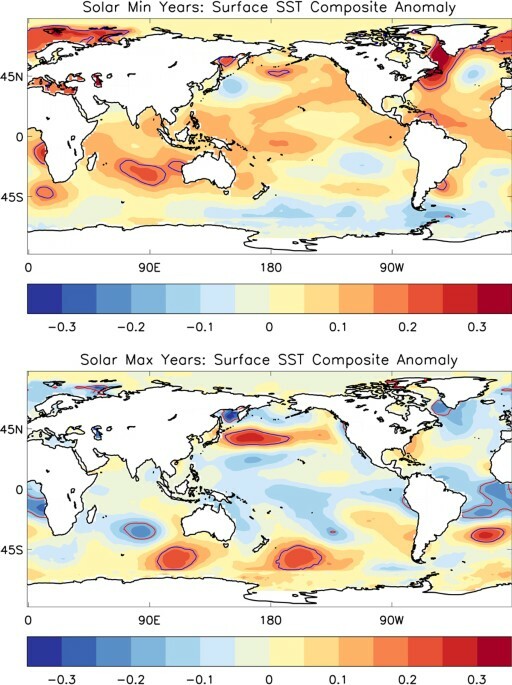 Tropical Pacific SST composites using NOAA Extended V4 (ERSST) data for solar Max (Top) and Min years (Bottom) during DJF. Levels usually significant up to 95% level are overlaid by opposite coloured contour. Plots are generated using IDL software, version 8 with the data from NOAA/OAR/ESRL PSD, Boulder, Colorado, USA, from their website at (http://www.esrl.noaa.gov/psd/). Importantly, the analysis shows little to no solar influence upon the ENSO 3.4 ocean sector, but as the graph above shows the effect is much broader. Roy concludes that ENSO operates mostly independently of solar influence. Even more striking is the result for NH winter, showing solar minima associated with generally warmer SST and maxima generally cooler. Dr. Roy explains the solar influence in terms of two separate processes. Bottom up is fluctuations in SSTs while top-down is UV effects upon the stratosphere extending downward expressed in SLP differentials. For a discussion of the solar/climate mechanism there is Solar cyclic variability can modulate winter Arctic climate by Indrani Roy Scientific Reportsvolume 8, Article number: 4864 (2018). Excerpts in italics with my bolds. This study investigates the role of the eleven-year solar cycle on the Arctic climate during 1979–2016. 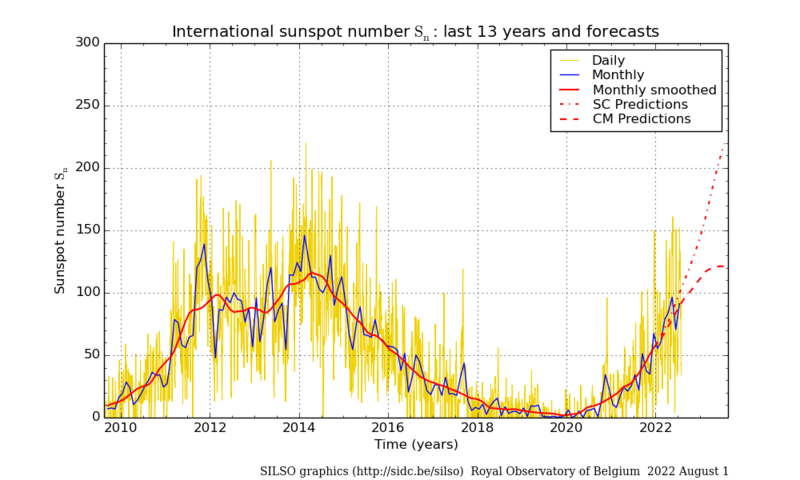 It reveals that during those years, when the winter solar sunspot number (SSN) falls below 1.35 standard deviations (or mean value), the Arctic warming extends from the lower troposphere to high up in the upper stratosphere and vice versa when SSN is above. The warming in the atmospheric column reflects an easterly zonal wind anomaly consistent with warm air and positive geopotential height anomalies for years with minimum SSN and vice versa for the maximum. Despite the inherent limitations of statistical techniques, three different methods – Compositing, Multiple Linear Regression and Correlation – all point to a similar modulating influence of the sun on winter Arctic climate via the pathway of Arctic Oscillation. Presenting schematics, it discusses the mechanisms of how solar cycle variability influences the Arctic climate involving the stratospheric route. Compositing also detects an opposite solar signature on Eurasian snow-cover, which is a cooling during Minimum years, while warming in maximum. It is hypothesized that the reduction of ice in the Arctic and a growth in Eurasia, in recent winters, may in part, be a result of the current weaker solar cycle. In summary, for solar Min years, the warm air column is associated with positive geopotential height anomalies and an easterly wind, which reverses during Max years. Such NAM feature is clearly evident supporting the hypothesis of communicating a solar signal to Arctic via winter NAM (North Annular Mode). Above: Mechanism to describe the stratospheric pathway for solar cycle variability to influence the Arctic climate. Mechanisms for (a) discuss a route where perturbation in the upper stratospheric polar vortex is transported downwards and impacts the Arctic on a seasonal scale via the winter NAM (flowchart is presented on the right). 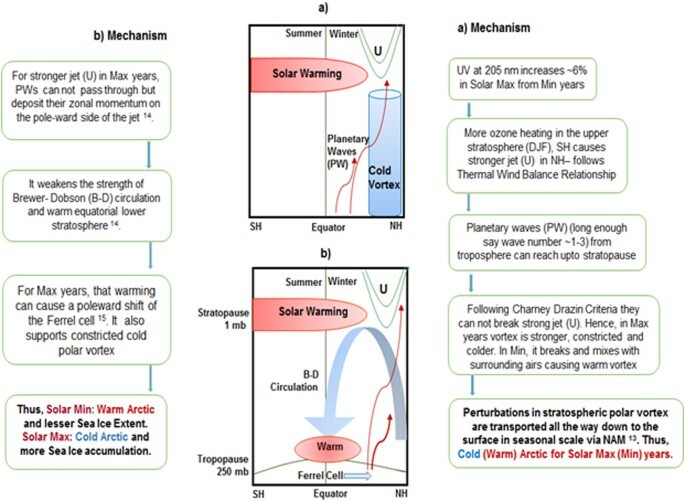 Mechanisms for (b) discusses the route that involves upper stratospheric polar vortex, tropical lower stratosphere, Brewer-Dobson circulation and Ferrel cell (flowchart is presented to the left). It is created using images or clip art available from Powerpoint. During DJF, Arctic sea ice extent suggests a strong correlation with SSN (99% significant) and even with AOD (95% significant) (Table 3a). SSN is also found to be strongly correlated with AO (95% significant). Figure 8a shows that significant correlation between Arctic sea ice extent and SSN is still present in other seasons as well. However, the correlation between SSN and AO is only significant in DJF, confirming that the possible route of solar influence on winter Arctic sea ice is via the AO. On the other hand, the influence of AO on Arctic sea ice extent is not present during winter. It is strongest during JJA, though fails to exceed a significant threshold of 95% level. Results of Correlation Coefficient (c.c) between Sea Ice Extent and various other parameters. (a) Seasonal c.c. for four different seasons are presented using other parameters as SSN and AO, and (b) c.c. for the winter season in different regions using other parameters as AO and AMO. Significant levels of 95% and 99% using a students ‘t-test’ are marked by dashed line and dotted line respectively. Plots are prepared using IDL software, version 8. In terms of oceanic longer-term variability, here we particularly focus on the AMO and find a strong connection between sea ice and AMO in winter, agreeing with previous studies45,46. Earlier discussions suggested that there are few differences in region A and B relating to trend (Figs S6 and S7), but correlation technique indicated a very strong anti-correlation between the winter AMO index and sea ice in all regions of our considerations (Fig. 8b)). Even using two different data sources (HadSST and ERSST) we arrive at similar results, and it is also true for overall sea ice extent. It could also be possible that, in region B, due to a strong presence of AO influence of the sun, it may mask some of the influence of the longer-term trend (seen in Fig. 2) to suggest a lesser trend, as also noted in Figs S6 and S7. The latest observations show this solar cycle is over, perhaps the next one beginning. With no sunspots seen since June, this is unusually quiet. The solar surface at the moment is “Spotless” and has been for a month. The sun is the primary source of energy in the earth/atmosphere system, but the actual role of the sun and related mechanisms to support varied regional climate responses and its seasonality around the world, are still poorly understood. Solar energy output varies in cycles, of which the 11-year cyclic variability is one of the most crucial ones. It causes differences in the amount of solar energy absorbed in the UV part of the spectrum within the upper stratosphere, varying from 6 to 8%. Such variation is believed to be one of the most important solar energy outputs to influence the climate of the earth and that knowledge of cyclic behaviour can also be used for future prediction purposes. Apart from solar UV related effects on earth’s climate, studies also identified effects related to solar particle precipitation. Various studies have also detected an influence of the El Nino Southern Oscillation (ENSO)22 and the Pacific Decadal Oscillation (PDO) on Arctic sea ice. An association between the sun and ENSO are discussed in various research. Because of related complexities along with various linear and nonlinear couplings among major modes of variability, the role of the sun on Arctic air temperatures and sea ice extent and related mechanisms remains poorly understood/explored. While many studies point to anthropogenic influences on the long-term sea ice decline, this study is motivated by the potential links between the sun and the surface climate through stratospheric processes. Alongside warming in the Arctic, a cooling is noticed around Eurasian sector despite continuing rise of greenhouse gas concentrations. Various modelling groups, however, made unsuccessful efforts to detect an association between Eurasian cooling and Arctic sea-ice decline. In this work, we evaluate the impact of the solar 11-year cycle, measured in terms of solar sunspot number (SSN), as a driving factor to modulate Arctic and surrounding climate. The influences of SSN on various surface parameters, such as Sea Level Pressure (SLP), Sea Surface Temperature (SST), and the polar stratosphere are well recognised. If there is indeed a link between the solar cycle and Arctic climate, it is possible that the 11-year solar cycle can be used to improve seasonal and decadal predictions of sea ice. In the present study, we use a combination of observational and reanalysis datasets to uncover relationships between the sun’s variability and Arctic surface climate, via the modulation of NAM and downward propagation of anomaly from upper stratospheric winter polar vortex. Our result suggests the latest rapid decline of sea ice around the Arctic in the recent winter decade/season could also have contributions from the current weaker solar cycle. The last 14 years are dominated by solar Min years and have only one Max. This is unlike other previous years, where the number of Max and Min years were evenly distributed (five each). The cumulative effect from the past 13 solar Min years could have played a role in the current record decline of the last winter, 2017. The current weaker solar cycle may also have contributions on increase in winter snow cover around the Eurasian sector. Presenting schematics and flowcharts, we discussed mechanisms of how solar cycle variability influences Arctic climate. In the first route, perturbation in the upper stratospheric polar vortex is transported downwards and modulates the Arctic in a seasonal scale via the winter NAM. Another route was shown, which could involve upper stratospheric polar vortex, tropical lower stratosphere, Brewer-Dobson circulation and Ferrel cell. It could also reinforce the findings of the ‘Solar Max (Min) – cold (warm) Arctic’ scenario. We live in an electric universe.